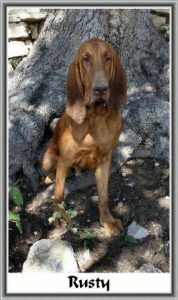 Rusty is the most energetic of our bloodhound pack. He is a very pretty light skinned red or liver nosed red. He absolutely loves the water and is a talker.. Rusty is so playful and a very smart boy. He has produced some amazing working hounds, full of drive and personality. We are so happy for him to move on to a family all just for him, but will miss him dearly.